Getting Igwe Laz Edward Nnayelu Ekwueme for an interview can be likened to squeezing water out of rock. It was at The Place, Ikeja during a workshop on the way forward for Nigerian movie industry. Sitting almost unnoticed to this reporter, the actor and composer was busy trying to grasp the minutest details of the programme. Initially, the reporter hesitated to approach the Professor of Music for an interview. Later, he summoned courage. Initially, he turned down the reporter's request but when he persisted, he finally obliged albeit for a few minutes. Even at that, the interview was conducted while the artiste was in motion. 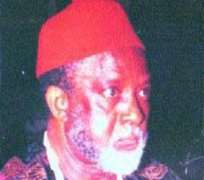 This icon of the arts and a monarch in Oko, Anambra State is a household name in Nigerian movie and music scene. Following his coronation as Igwe, Ekwueme also joined the league of actors who were later crowned kings. He is many things rolled-into one.He is a master of ceremonies, an actor, composer, an impresario of the arts. At 71, the music scholar is not resting on his oars in his contributions to the advancement of the arts. Having featured in many films, the Igwe does not restrict himself to the roles of moneybags or the affluent, he also plays the role of subjects. By that, he also feels the pulse of the suffering masses. Ekwueme's passion for the industry cannot be over-emphasised. He retired from the University of Lagos after almost four decades in academia, building and nurturing budding artistes. He is author of 13 books on different branches of the arts (music and theatre), as well as monographs, numerous scholarly works and journal articles and has contributed chapters in several other books. He is a member of many scholarly societies. Acting as a bridge between the gown and the town, the indefatigable septuagenarian who founded the famous Laz Ekwueme Chorale, spoke to us about the industry as well as other issues. The whole industry is getting crowded and the movies are not selling as fast as before. Actors are not well paid. So, it is about time we give the whole thing a second thought. I commend the organisers of this programme. It was a good get-together and it afforded us the opportunity to discuss issues affecting the movie industry and those of us who are practitioners; whether as actors, producers or directors. We rubbed minds and saw where we could go from here especially now that the industry is over-crowded. I spoke about censorship, for example. The Censors Board does not allow one to produce a movie in more than two parts. A movie can have more than two parts if it's a story that is continuing. Government regulations prevent banks from giving out loans without collateral. Perhaps, they can do something about that for artistes and artistic products. There is a lot that government can do; like setting up a special bank that gives revolving loans for film producers, among others. It is difficult to say. Challenges, is probably not the best word. Perhaps we should say that the industry is interesting and exciting. I am choosy and somewhat finicky before I take a role in a film. Having featured in many films since I joined the movie industry fully, some of the outstanding ones include: Never Say Never, Love Story, Worlds Apart Paradise, Saviour, Dance In The Forest, among others. There are the traditional period and set, or epic movies like, The Golden Axe, Secret Adventure, Blood of the Orphan, and Formidable Force. I've just acted in Treasure Hunt and Lords Of The Game. I studied music, drama, English and languages. I taught English - and I still teach speech and drama at the University - until I retired. I have a Ph.D in Music. I practised every genre of the arts. All the arts are inter-related, especially in Africa. Music, drama and speech, and all literature are inter-woven. You really can't practise any one of them well without knowing quite a bit about the others. God is great. We give to each role what it requires. We give to Caesar what belongs to Caesar and to God. When it is time to play the Igwe in real life, we do that and when it is time to play the Igwe in the movie, we play Igwe in the movie. When it is time to conduct my choir, I do that. Long time ago, I looked up to actors and dancers in the movie industry such as the late Frank Sinatra, Sammie Davies Junior. They were my models when I was a teenager in the show business. However, some of the best practitioners of the arts include Agen Hood, Gordon Jacobs in music, among others. I try to emulate them. But the perfect role model is Jesus Christ.